This year we are continuing our effort of engaging in various practices to cultivate wholesome qualities of heart and mind. This process is also known as Tikkun Middot. This program is meant to help us positively develop qualities of the heart and mind. Through it we will explore practices of mindfulness, study, hevrutah and daily practice with the aim of understanding and strengthening important ethical/soul traits. Bnai Keshet has the honor of being one of a dozen Jewish communities who will be implementing this curriculum sponsored by the Institute for Jewish Spirituality. Each month we will be inviting you try out simple exercises to help you grow in that month's middah. The goal of such exercises is to bring unconscious thoughts and feelings into awareness, thus making choice possible. If continued over time such practices can also make desired behaviors more habitual. This is an introductory class for those who have not yet participated in an ongoing Tikkun Middot study group. Each month we will be inviting you try out simple exercises to help you grow in that month's middah. The goal of such exercises is to bring unconscious thoughts and feelings into awareness, thus making choice possible. If continued over time such practices can also make desired behaviors more habitual. This year we have separate monthly classes on Monday nights for both those new to Tikkun Middot and those that want to continue where they left off last year. While Emunah is usually translated as faith, in this session we focus on its related meaning – Trustworthiness. Emunah shares a Hebrew root with Oman, an artisan -- someone who can be trusted or relied upon to produce a quality product. Emunah is that quality of reliability that we engender in others through our sustained honesty and consideration. A person or institution that acts with Emunah/trustworthiness is one in which you can have faith. The farmer who sows seeds places his faith in the Lifegiver of All the Worlds, for he trusts that God will provide all that is needed for his crops to grow. If the farmer didn't trust at some level that the seeds would grow in the ground s/he would probably not go to the effort to hoe and plow and do all the work needed to produce crops. Education is very much the same – Educators invest a tremendous amount of energy preparing classes and giving of themselves to people of all ages based on a trust that people can connect, learn and grow. Without this basic trust, the work of education would feel too hopeless and hard since the results are not immediate. What do you need to rely on, or have trust in, to function well in your work, in your community or at home? Communities, organizations and societies are built on trust. How do people know if they can trust one another? Heroic, dramatic gestures like saving someone from a fire may generate gratitude, but trust comes from the many daily, small transactions done repeatedly over time. To be trustworthy/ne'eman is to be "strong ground" that can hold a tent peg secure. Strong ground does not always mean completely solid ground. A tent peg needs soil that is flexible and a little loose to be able to enter. It also needs soil that is not completely dry so it will grip the peg. Let your mind explore this metaphor to see what is at stake in developing this middah of Emunah/trustworthiness, especially for people who lead others. Each day do one at least one thing (promptly replying to an email, following through on a small commitment, arriving on time, etc.) that will reinforce another's trust in you. Write a phrase on an index card and repeat it for several minutes at the beginning of your day to focus your attention on this middah throughout the day. Nasati v'natati b'emunah? – Have I been faithful in my transactions with others? Emunah is trusting in the world, being worthy of the trust of others, and being firmly rooted and steadfast. "When friendships are real, they are not glass threads or frost work, but the solidest things we can know." "...For like a rugged tree you are hard and sound at the core." "A steadfast heart does not stray from the path." "Be like the cliff against which the waves continually break; but it stands firm and tames the fury of the water around it." "People will walk in and walk out of your life, but the one whose footstep made a long-lasting impression is the one you should never allow to walk out." God through speaking our prayers. other and use positive self-talk to keep a healthy perspective. To begin our exploration of the meaning of this term let’s look at two quotes from Rabbi Shlomo Wolbe’s introduction to the middah of Kavod in his Aley Shor II: “The word “Kavod” is from the Hebrew root “K.V.D.” (which means weighty or heavy). The diametric opposite is the word “Klala”(curse) which comes from the Hebrew root “K.L.” (light). When I relate to someone with due seriousness I honor him, and if I treat him lightly it is as if I curse him.” “…Kavod is external behavior mandated by and appropriate to a reality of inner holiness. How do these ideas find expression or not in the following statements about Kavod in Pirkei Avot, chapter 4: "Rabbi Elazar HaKapar says: Three things drive a person from the world - jealousy, base desires and kavod." "Ben Zoma says…Who is honorable? One who honors all others." Bitachon may be one of the most difficult middot to acquire. 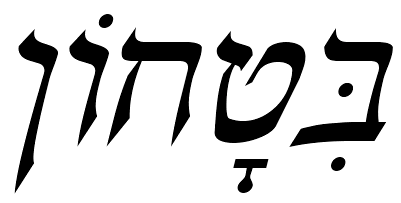 The Hebrew root for Bitachon is ב.ט.ח. (B.T.Ch.) which means to be at ease, to trust and to be confident. In modern Hebrew the word Bitachon also means security and thus the Misrad HaBitachon is the Defense Ministry and Bituach Leumi is the National Insurance system. In classic Jewish literature the ultimate source of this sense of security is God. Bitachon as a middah does not require that we have absolute trust in an omnipotent God. Like with all middot, there is a continuum and we each get to locate our own souls on the continuum. Some people move through life with an unshakeable belief in God’s goodness and protection. Others are much more anxious and worry fills their days. Neither extreme is necessarily good. Wherever you are on this continuum, working on Bitachon means moving towards balancing trust in a loving God or a benign universe with taking initiative. You never have to believe something you actually don’t believe to grow in Bitachon. We will start with a very practical issue, our livelihood. According to the mystical tradition God created the world simply to bestow kindness and love on all creation. 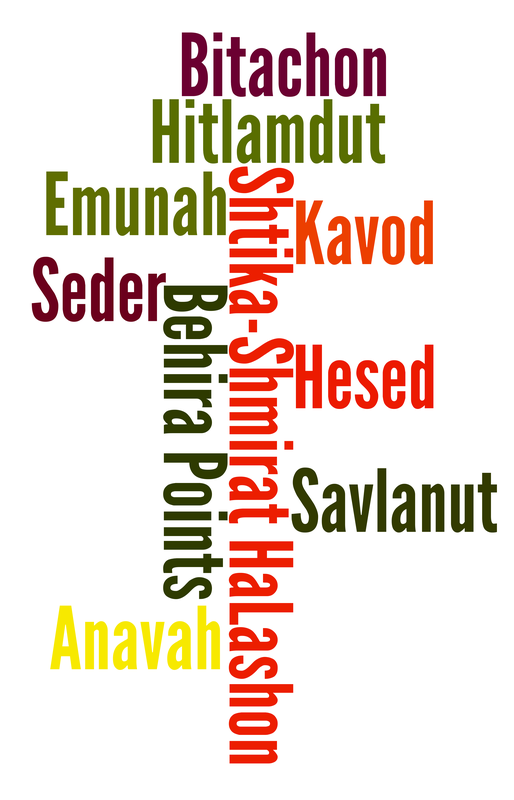 This constant outpouring of Chesed is what started and sustains the world. We humans are also creators. This is one of the most important ways that we imitate God. What is our means of creating and building the world? We might think it is our imagination, our ability to envision something new. Mussar master Rabbi Shlomo Wolbe (d. 2005, Israel) teaches that it is Chesed. Each act of Chesed builds the world. NOT A DAY GOES BY when we don’t face some sort of frustrating delay or obstacle, and too often our response is to strain against how things are. That tends to happen to me when I’m rushing somewhere in my car, but those feelings may suddenly sneak up on you while the water fills the tub ever so slowly, or as your child struggles with clumsy fingers to master the complexity of a shoelace, or on those days when nothing—not your Internet server, not your spouse, not the postman, nobody! !—does things when or how you want. Impatience seldom makes things happen faster or better and usually only causes us grief. It’s like an inner blaze that burns us up without giving off any warmth. That would be bad enough, but it is also a short step from impatience to rage, and we all know what harm can come to ourselves and others because of uncontrollable anger. Patience is…a tool we can call on to help us endure when we find ourselves in difficult circumstances we did not choose and could not avoid. [This] is revealing something essential about patience as this attribute is understood in the Jewish tradition. The Hebrew word for patience is savlanut, which can also mean “tolerance.” The same root gives rise to words that mean “suffer” and “endure” and also the noun for a porter who carries goods. We can learn something fundamental from this pool of words that derive from the common source: patience means enduring and tolerating, and the experience may even bring us elements of suffering. We get a hint of the same message in the English word “suffer,” which means both to experience pain and to tolerate, or put up with. So patience is not just about waiting, it’s about bearing…Patience comes into play when you are already ticked off, when the situation already has you starting to fume. It’s then that you reach into your pocket to pull out your patience, which helps you bear the burden that is pressing on you. The problem with impatience is that it usually takes only a split second for its first glowing embers to ignite into flames that course through us even before we’ve become aware that they have started up. Impatience snuffs out consciousness, and before I even know it’s happening, I’m leaning on my horn, or you’re going hoarse yelling at your child or cursing the postman. At this point we don’t even recognize ourselves, and there is little to be done but to try to rein in these feelings enough to minimize any damage we might do. It’s so much better to be able to catch our impatience as it is arising and to nip it in the bud. To do this we need to recognize the fact that we are getting impatient and then take responsibility for our impatience. This is much easier said than done. For example, it is common that when a couple is getting ready to go out for a pleasant evening, one of them is always ready before the other. And it is always the same one who is ready first and waiting at the door while the other one has to make one more phone call, or change shoes or tie or dress one last time, or check on something or other. Time passes, impatience grows, and by the time they are both in the car heading out for the evening or to visit friends, they are not even speaking to each other. The tendency is for the one who is always ready first to become righteous and blame the other one for bad behavior. While it surely isn’t good to be unpunctual and to waste other people’s time, what the impatient person tends to be blind to is that he or she has the personal freedom to choose to call upon the power of patience in that moment, in order to bear the situation without smoldering and then igniting and acting out. Morinis, Alan (2011-05-18). Everyday Holiness: The Jewish Spiritual Path of Mussar (pp. 55-62). Shambhala Publications. Kindle Edition. 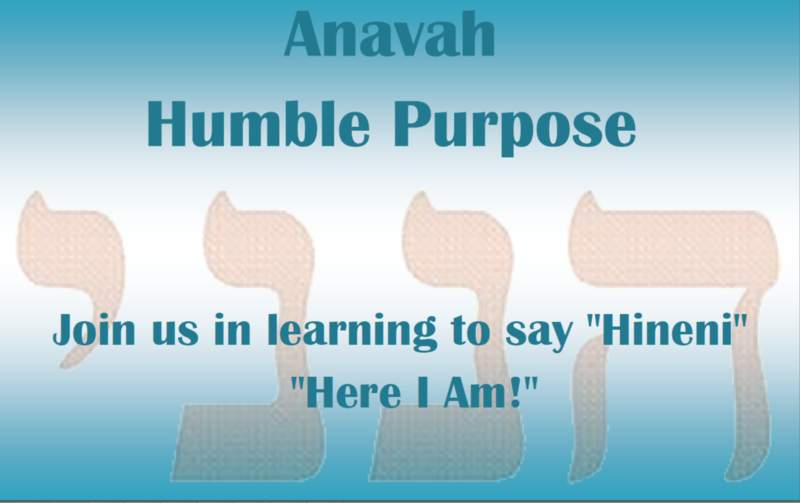 In Jewish Tradition humility is not about diminishing one’s self. It is becoming present, aware, and comfortable with one’s place. When we understand our place, we give others their space too. It is when we take up so much space that we squeeze others out, or take up so little space that the responsibility falls onto other’s shoulders that we are not showing anavah. Humility is a journey of right sizing in our life, which at some times will be about expansiveness, and at other times will be about contraction. What is your relationship to “taking space”, and how does it relate to a sense of being fully present in the moment? When do you say Hineni/ Here I am? When are there times when you show up and it feels right? When are there times when it feels like you have overstepped? When have you felt like you kept silent or didn’t show up that you regretted? How would anavah support you in these decisions in the future? Choose a meeting or time of day that you will take up more or less space than is typical or comfortable for you. This could mean that you will be the first to speak in a meeting, or that you will not speak until everyone else has a turn. Your practice could be being sillier and louder than usual with a group of people each day, or letting your partner or your child initiate conversation at the dinner table. Simply notice how it feels to change your behavior. It may be uncomfortable at first; is it less uncomfortable after several tries? What are you noticing about how much space you typically take up in different situations and how things around you change when you change? Rabbi Eliyahu Dessler, one of the great Mussar teachers of the 20th century, sharpens this concept of free will in a way that accounts for nature and nurture. He writes that all humans have free will only at something called a Bechirah/Cho'ice point. To explain this idea he offers an example of a smoker. The smoker coughs heavily at night and cannot sleep. He promises himself that he will not smoke again the next day. The next morning he thinks, "I'll have just one." He knows from experience that once he smokes that first cigarette he will crave a second and will be unable to stop himself. However, he believes the thought, "I'll have just one," and lights up. Of course, he ends up smoking a pack and lies awake coughing at night only to repeat the whole exercise the next day. The Bechirah point was the moment he chose to listen to the voice that said, "I'll have just one." This may be a familiar situation for many of us. We are in a Bechirah point when we sense a struggle between what we know is the right thing to do and what we feel we want to do. Ideally our feelings align with whatever is right, but until we reach a high level of spiritual growth, feelings are better taken as information and not as guides for action. We are on a ferry. It’s a big boat. It will take forty-five minutes to cross the water. We are in the snack bar at a table. I am reading the newspaper. Trying to at least. Because, at the next table are four businessmen. They are discussing business, loudly. One steps away to talk on the phone, loudly. The remaining three chat loudly. One starts explaining how he loves to tailgate at football games but, he says loudly, he just can’t drink the way he used to. Why not? Because he’s in his forties now, and damn if he doesn’t have to pee all the time. Plus it’s not as much fun as it used to be to pee in a bush. I am at a choice point. I can choose how I want to react and even how I want to feel about the men at the next table. I don’t actually have to be annoyed by them. Instead, as an experiment, I choose to try and see them through benevolent eyes. Here are a bunch of men really enjoying their conversation. It’s noon, they are on a boat, it’s pretty boring on the boat, and they are having a great time. They are completely uninhibited. They are not at all worried about what I think about their conversation or what anyone thinks. I try to imagine that! Good for them, I think. That must feel great. I feel much better thinking about how great they feel, instead of grousing in my own head about how annoying they are. I am watching a series of Oscar nominated short films and I am thinking, how can these bad movies be the best short films this year had to offer? Every one of them is bad. Each one worse than the next. I am totally wasting my time. I start listing the other things I could be doing if I wasn’t stuck in this theater watching bad short films. Wait: it's a choice point! I can stay and wallow in the pain of being stuck wasting my time watching bad short films, or I can look at these short films with a benevolent eye. Maybe they are not entirely awful in every way. In fact, once I try this out, I discover the films each have something positive in them. One of them has no story but it is visually gorgeous. Another has a brilliant set-up, even if the pay-off falls flat. What happens when I choose to notice what the films do well instead of listing their failings? I have a better time. Noticing a film’s beautiful music or gorgeous visual style can offer a small moment of feeling transported. Being annoyed by the film’s failures offers nothing more than feeling sour. I make a note to myself acknowledging that in my work it is necessary for me to retain a critical eye and sometimes there’s a benefit to seeing the dark side, if only to mine for humor. But in my life, it feels way better to choose benevolence over snark. Hitlamdut – Mindful Curious Introspective Awareness. Our first practice this year is the simple practice of intentional curiosity. We are practicing an interested stance that assumes we can learn from all things. Part one – For a week or two choose a small, routine practice in your life from which to learn each day. For example- brushing teeth. The idea is not to brush your teeth better, but to notice what you can learn from the act of brushing your teeth. If you say blessings over food or other things regularly – what can you learn from the actual practice of saying the blessing? Again, the goal is not to say the blessing with more Kavana (intention), but to glean something from the experience of how you say the blessing. Any simple thing you do daily will work. Part two – For another week or two of practice notice what you can learn from the small actions of others at least 3x/each day. These can be three things from the same person or from different people. My friend, Rabbi David Jaffe, offers this example: In synagogue one Shabbat a friend of mine handed me a Bible just before we got to the Torah reading. I was just about to go get one for myself. I learned from him about seeing the needs of other people and doing something kind for another person. The goal of the practice is to open us to noticing others with an eye toward what we can learn. I waste a minute or so trying to come up with a more creative idea for what practice to notice and then I decide, brushing teeth is perfect. It’s so hard to remember to practice something, and since I do brush my teeth every morning I am optimistic that I will be able train myself for one week to remember to pay attention to that.